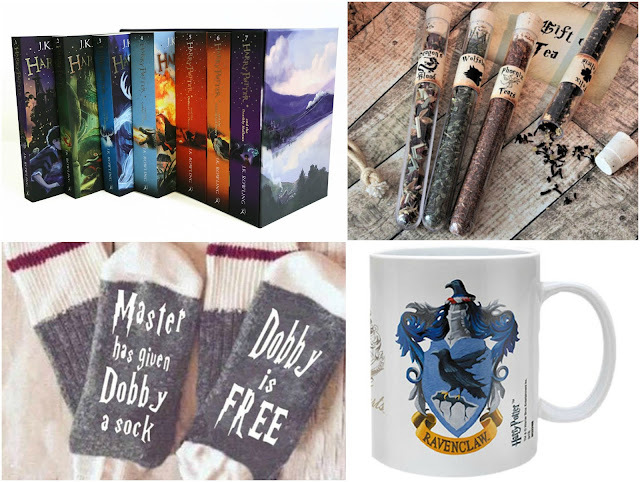 Enter this giveaway for a chance to win a Harry Potter box set, Wizard tea by Rosie Lea Tea, Dobby socks and a Ravenclaw mug. Good luck! Severus Snape is by far the best character in the books. I'm not sure that Rowling knew how much of an impact his character had for a lot of us. His portrayal of love and sacrifice leaves a lot of room for discussion. Love Ron as he is a true friend to Harry and completely the opposite. Enjoyed his funny side. Book!Ginny, she's funny and confident and a great role model! Severus Snape. He was so delightfully frightful and sinister. Yet also loyal, as we see later in the stories. I love fred and george. They always make me laugh. Hermione! I adore her wit, her cleverness, her honesty, and her determination! She is also absolutely brilliant and loved that she was such a dedicated friend! "Who's your favorite Harry Potter character and why?" Tom Riddle, because he's elegantly sinister. I love George because he always makes me laugh. Hermione. She is the best, Harry could have not done it without her. I also happen to identify with her. I like Harry Potter. He underestimated himself along the way but became a leader for others through his courage. My boyfriend would love some of these goodies as he’s a huge fan. Hermione! I love how sassy & smart she is! Hermione is my favourite because she is strong and loyal to her friends. Hermione because she is such a strong and clever female character. Hagrid because he has a heart of gold! Heermione is my favorite because she's so sassy! Dobby the elf is by far my favourite character. I recently visited Harry Potter world, which is a must see for any HP fan, where I could not resist standing in the middle of the great hall finding myself shouting "Harry Potter must not go back to hogwarts" in a Dobby accent of course. My favorite characters change every few readings. For the longest time, Ron was my favorite. I identified with his insecurities; I found him the most relatable out of the trio; and he always made me laugh. I won't lie, Rupert Grint definitely helped my love for Ron grow even more. I used to get so annoyed by Harry from the 5th book on until a couple of years ago. I started to really understand Harry, why he was so moody, and how frustrating it had to be for him to be RIGHT about Malfoy and have absolutely no one believe him. I used to roll my eyes when he would get all moody in the fifth book. But then I realized, hey, he's a fifteen year old kid (excuse enough right there), had a friend die right in front of him, saw Voldemort come back and, once again, no one is believing him, and then he gets iced out by his friends that summer. Why Hermione and not him? (By the way, does she ever see her parents?) And then things just snowball for Harry from there. I guess I just started to realize how well JK showed his psychological scars (and age). Recently, I've fallen in love with Horace Slughorn. Not because he's a great guy or anything, but my God, what a great character. I love how he shows the Slytherin traits in a way that isn't evil. He has so many quirks that are rich and man, I just think he's super well-developed. My favorite character is Hermione, she taught me that it's ok to be smart and like books. I love Ron because he's always smiling and he's super funny. Hermione because she works hard despite the opposition. Fred and George, I love all their jokes and pranks. Hermione because she's brave and smart. Dsmn, that's like asking a mother about her favourite child! I love them all! ThreaThno favourite because they all together created this masterpiece. It wouldn't have been so awesome if even one of them hadn't been there. So yeah, they are all my favourites! Hermione is my favorite, I love a brainy character. My favorite Harry Potter character is Hermione for her zest. It has to be Snape - he was kind of the ultimate character you love to hate! Snaps is my favourite character, he is truly complex, so much depth to him and i feel so much empathy when you fully understand him. Has to be Dobby for me, first of all he's adorable and most of all i love his unwavering loyalty to Harry! Hmm, that's probably Ron he's such a faithful and loyal friend. Ginny. She is brave and tenacious. Hermione is my favorite character in the series. I liked her because she was a good friend. Strong and loyal to all of her friends. Dobby, he's sweet and brave. He does what's morally correct no matter what. Severus Snape!! He is the embodiment of love conquers all! Who's your favorite Harry Potter character and why? My favorite is Dobby because he's just so darn adorable and has such a big heart! I like Hagrid. Everyone needs someone like him on their side! Remus because he is such a good-hearted and kind person! I love Ron Weasley, I find him so endearing! Hermione of course because she's smart like me!! Hahaha!! My favorite character is Hermione because she's so strong and smart and gets them out of a lot of trouble. Lord Voldemort. The Dark Lord is an ambitious, intelligent, over-achiever but unlucky when it comes to love and empathy. Though it's not his fault as he was conceived under a love potion. There is not a single character who is as focused as him. Severus Snape absolutely, because I see so much of myself in him. Is a hard question. Sirius Black because is a good person. My favorite is Hermione. She is smart and loyal and funny. I love that she didn't end up with the Harry. lol. She is fantastic! Sirius has been my favorite ever since he was introduced. Both in the books and the movies, this character showed unrelenting care for Harry. Thanks for the super giveaway opportunity. My favorite character is Hermione Granger. I always adored her throughout the series. She is a strong woman and and a gem of a person. Hermione! Because she is smart and kind. I would like all girls to grow up like her, fierce and loving. Okay, I'll decide... my favorite is Hermione! She's so smart and I think she's the most strong girl in Hogwarts as student. She's really cute too, and I love how she angry to Ron because of her anxiety for the red haired keeper and her pure love for him. She's not that honest, but she always care about her friends. Too much sacrifice that she give for both Harry and Ron. Hermione! Not because she is beautiful, but she had given her maximum contribution for destroying the horcruxes in Deathly Hallows. Without her Harry would have been dead. I am still reading the first book so i do not have a fave yet. Ron is my favourite character because he is warm and lovable. Hermione is my favorite since she's so booksmart! I love how cool and smart Herminoe is. My favorite character is Snape, I think he is one of the most complex and interesting characters in the books. It changes with every book but I alwys liked Hagrid. My favorite character is Neville Longbottom. He's sweet when he could so easily be bitter. Even though he's clumsy and shy, he's not afraid to stand up for himself and others. Loved reading about his growth throughout the series. I like Hermione as she's clever, witty & brave - a really great female role model. I LOVE Snape for his loyalty yet being sneaky enough to play both sides. Hagrid because he is a loveable big lug! Ron is by far the best! I actually couldn't choose one. I find J.K. Rowling is genius in creating the characters. All stand out with their own unique features. Harry Potter and Lord Voldemort are simply iconic. I really like Hagrid, he is so loveable and protective over those close to him! Luna Lovegood because she isn’t afraid to be herself, she’s compassionate and loyal. Sorry! In today's "Enter another With Love for Books Giveaway" is "May New Release Giveaway Hop"
I have to say Ron because he reminds me of myself. imagination given to his character and the development of it by JK Rowling. Is it weird that Snape is my favourite - always been a fan of the people others don't like in films. He's so dark and menacing and I always suspected him of "being up to no good" lol. Alan Rickman played him perfectly as well on screen. Neville Longbottom. You truly see him grow up and become stronger in his own skin with the help of everyone around him.